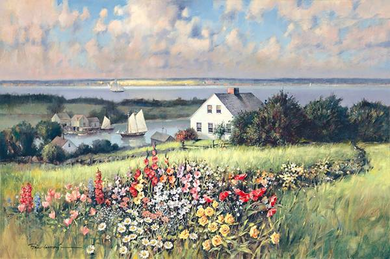 Paul Landry Fine Art Anniversary Edition Giclée Canvas:"Summer Hill"
Size: 14" h x 21" w, ships gallery wrapped Open Edition / 20" h x 30" w Limited Edition SN Canvas w/ COA. Edition: Open and Artist Signed and Numbered, Limited Edition to 100. About the Artist: The work of Paul Landry can brighten a room by its presence alone. Romantic images of flower-filled seaside gardens, cozy cottages, and ocean shores, the paintings are bright and airy and filled with lush colors. Now one of the most popular nostalgia artists in the U.S., Landry was born on the coast of Canada, in Halifax, Nova Scotia. The grandson of two sea captains (one Scottish, the other French), it was inevitable that he, too, turn to the sea as he grew older, working with fishermen on the banks of Nova Scotia and helping them pull up their nets and traps. Never far away were his sketchpad and camera. "I believe that you have to know your subject to paint it well," he says. "Spending time on the sea has allowed me to know its many moods." By the time Landry was seventeen, he had gained apprentice status as a photoengraver. He started working his way through the Nova Scotia College of Art and also attended the Art Students League in New York City. Shortly afterward, he took a brief sabbatical to paint the sea and the people who make their living from it. Finally Landry settled in Connecticut, where he taught at Westport's Famous Artists School and wrote the popular textbook On Drawing and Painting. He still lives near the shore, enjoying the company of his wife and three children. He maintains an interest in sports car racing, gardening and golfing. His second book, "The Captain's Garden: A Reflective Journey Home Through the Art of Paul Landry", was published to unanimous praise in 1996. His third book, "At the Heart of Christmas," published in 2001, was an instant sell-out. Landry's paintings have a loyal and growing audience because they celebrate the spirit of life and bring back memories of halcyon days. "The sea, the villages that border it and the people who work it all hold a great fascination for me, providing unending sources of inspiration as they beckon my heart and hand."